Focuses on techniques for alleviating dental anxiety, fear, and phobias through positive interior support design and environmental distractions. Reports of dental anxiety in up to 74% of children and adolescents imply that anxiety is a major concern in dental offices. Pediatric dental theming vastly improved patient experience by relieving anxiety, fear, and phobias from a young age. It is also possible to have a significant positive impact on the duration of a patient’s life, as well as future generations by halting the cycle of dental avoidance through office theming. Highlights several support design techniques and delves into the reasons why theming in medical environments is so crucial to patient wellbeing. Anxiety, by definition, is a “state of apprehension resulting from the anticipation of a threatening event or situation” (American Heritage Science Dictionary). Anxiety is differentiated from fear, as fear occurs in the presence of an observed threat, while anxiety requires no tangible manifestation. Anxiety may develop into a phobia; which is defined as a “persistent, abnormal, and irrational fear of a specific thing or situation that compels one to avoid it, despite the awareness and reassurance that it is not dangerous” (American Heritage Science Dictionary). Dental fear, anxiety, and phobias negatively affect patient care and can develop from an early age. A cross-sectional study of 100 patients from the Pediatric Dentistry Clinic of the Federal University of Parana found that 74% of children and adolescents between experienced some form of dental anxiety based on the responses that were measured with the Corah’s Dental Anxiety Scale (DAS) and the Trait Anxiety Scale (TAS). This can be seen in Figure 1 on page 11 (Assunção et al., 31:175). Comparison studies such as the one carried out by Bedi, Sutcliffe, and Donnan; showed that the prevalence of severe dental anxiety in 6-7 year old children is higher than any other age group (Bedi, 2:17-24). Dental anxiety, fear, and phobias have been shown to persist into adulthood that can potentially lead to dental avoidance in patients. A study at Jimma University Specialized Hospital showed that children with dental anxiety were found to have avoidance of dental treatment (Bezabih et al., 115-21). Avoidance is not strictly a childhood affliction. One study suggests that, in the US, more than 80% of the population fear dental treatment, and 20% avoid the dentist due to severe dental fear (Milgrom et al., 116: 641-7). When narrowed down specifically to adult patients, a study on the prevalence of dental fear and avoidance found that approximately 10% to 20% of the adult population in the western industrialized world report high dental anxiety; most also report this reaction as having developed in childhood (Gatchel, 118: 591-3). It is exceptionally important to treat anxiety in the childhood stages of development not only for the sake of the child’s health but for the benefit of office revenue as well. Parents who experience anxiety are likely to pass on these traits to their children, regardless of if they intend to or not. A cross sectional study of patients at the Pediatric Dentistry Clinic of the Federal University of Panama found that dental anxiety scores were correlated among the adults and children, and associations were found between children’s trait anxiety and the dental and trait anxiety of their parents (Losso et al., 175). There is a harmful cycle in which a child develops dental anxiety, fear, or a phobia and the anxiety persists into adulthood. Dental anxiety that the adult faces is then passed onto future children, who in turn develops their own dental related anxiety and begins the cycle anew. 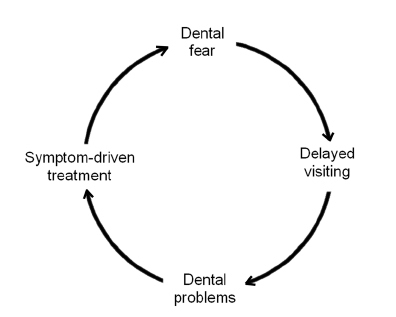 A model of the dental fear cycle can be found on page 11 (Figure 2, Armfield). A study on maternal dental anxiety found that children whose mothers exhibited a moderate or high level of dental anxiety had an increased likelihood of exhibiting cavities and tooth decay when compared to children whose mothers reported low dental anxiety (Goettems et al., 46:3-8). Consequently, dental avoidance influences the bottom line of a dental office and negatively impacts revenue due to missed appointments, cancellations, and difficulties with patient recall (Koohoot). It is also important to note that aside from monetary loss there is often a cost in time and resources in dealing with a child who experiences dental anxiety, fear, or phobia. Anxious patients tend to overestimate pain and discomfort caused by dental treatment and may also postpone or miss appointments with negative consequences for their oral health and often having to incur more complex interventions, thereby entering a vicious cycle that tends to intensify anxiety with regard to treatment (Armfield et al.). As a result, the frequency of dental diseases and unpleasant dental experiences is greater among children with more anxious and uncooperative behavior in comparison to non-anxious children (Themessl-Huber et al., 20:83-101). In terms of anxiety treatment there are countless medical and behavioral techniques that can be used on a patient-by-patent basis. However, in order to counteract anxiety on a broad scale, changes to the dental office environment can play a crucial part. There have been several investigations into the effects that the built environment has on patient health outcomes. This can be shown in long-term effects of healing, the mental health of the individual during the treatment, and even the mindset of the patient before arriving at the healthcare environment. There is suggestive evidence that aspects of the designed environment exert significant effects on clinical outcomes for patients (Rubin et al.). Georgia Houston, a graduate of industrial design at the University of Calgary’s Faculty of Environmental Design, completed a master’s degree that focused on the significance of using design alternatives to promote a positive dental experience, as well as improve long-term dental health. “Design won’t eliminate procedures that are uncomfortable, but it can shape young patients’ perception of an experience which is paramount,” says Houston. “Through design we can help reduce anxiety before, during and after the dental office visit, while increasing the child’s sense of choice and control over the experience” (Obad). The focus of many of these investigations and studies is what is known as ‘supportive design’. The term supportive refers to “environmental characteristics that support or facilitate coping and restoration with respect to the stress that accompanies illness and hospitalization” (Ulrich). Supportive design can come in many forms. From the color of paint on the walls to the texture of the flooring, every small aspect of a design plays a role in impacting the psychological state of the patient. Supportive design has become a key feature in dental construction and renovation. An example of supportive design is found in dental theming. Theming refers specifically to “the use of an overarching theme in order to create a holistic and integrated spatial organization of a consumer venue” (Lukas). A prime example of dental theming by Imagination Dental Solutions is an office that is designed to look like a playful jungle or a calming underwater scene. A full supportive design environment often includes illustrated wall murals, fully three-dimensional sculpted characters, and interactive elements that match the overarching concept. There is an increasing demand for creative solutions to positively impact the mental and physical well being of patients and staff in medical environments. The American Academy of Pediatric Dentistry (AAPD) released a reference manual for dentists in 1990 that has since been updated periodically to include new guidelines for managing patient behaviors in pediatric dental practices. Throughout the manual, they discuss the need for supportive design by way of a child-friendly reception area that can both provide a distraction and indicate that the staff has a genuine concern for young patients. They explain that these first impressions may influence future behaviors in patients (AAPD). In his journal on the Effects of Healthcare Environmental Design on Medical Outcomes, Roger Ulrich discusses the notion that humans react positively and pay attention to the following types of features or environmental-social content: comedy or laughter, caring or smiling human faces, music, companion animals, and nature such as trees, flowers, and water. Many themes that Imagination Dental Solutions creates include calming natural environments, waterfalls, and companion animals that give off a friendly and humorous vibe. An example of this would be a jungle-circus dental theme in which an illustrated wall mural is filled with friendly animals in humorous situations such as a snake being used as a tightrope, while the background highlights rounded plants and aquatic areas. Dental theming is also a key component of positive distractions. Positive distractions refer a “subset of environmental-social conditions marked by a capacity to improve mood and effectively promote restoration from stress” (Ulrich). Traditionally, positive distraction has come in the form of asking a child to imagine a positive situation in their mind, count ceiling tiles, or even calculate arithmetic in their heads. Though all of these tactics help distract children to a degree, they only help if the child is able to concentrate, and they do not further supportive design or the environmental characteristics that make this form of design so successful. Offering a tangible distraction can positively impact the medical experience, which is where dental theming plays a crucial role. Imagination Dental Solutions creates ‘I Spy Murals’ that encourage children to find characters and items throughout a large illustrated art piece. Giving a child a task such as searching through a wall mural to find hidden treasures can shift the focus away from the procedure at hand, while also supplying the aforementioned natural fauna and flora that human beings find comfort in. A large wall mural also provides positive distraction through bright colours that can improve mood through colour theory. A study on the positive influence of art in hospital environments found that the majority of patients reported positive emotional reactions to art depicting natural environments having scattered trees and/or non-turbulent water features (Carpman et al.). In his journal Stress Recovery during Exposure to Natural and Urban Environments, Ulrich notes that these particular nature scenes are quick to produce mood improvement and elicits beneficial physiological changes such as lower blood pressure and reduced heart rate (Ulrich, 201-230). Recently, hospitals have begun testing on the use of positive distraction in pediatric environments, an action that can be mimicked in children’s dental clinics. The Children’s Hospital of Pittsburgh pioneered what they coined as ‘distraction rooms’. They included wall murals and characters to distract children from the action of taking a CT scan in order to lower fear and anxiety that caused many children to require sedation during treatment. The results of the distraction rooms led to a 97% reduction in sedation rates. After such an overwhelmingly positive change in patient mindset, the hospital has since constructed 28 more distraction rooms (Hilton). Offices that have created supportive design themes through Imagination Dental Solutions have found similar results. Dr. Tonya Triplett began with a single themed pediatric dental office in 2004. Since then, she has created three fully themed dental offices and reports that the themed environments have been responsible for bringing in thousands of new patients. Dr. Djuana Cartillar, who wished to bring the feel of Disney Land to her patients, reported that they expanded their practice after seeing the joy that supportive design brought to young patients (Mitchell, 43-44). Dr. Barbara Sheller, DDR, MDS, the Chief of Pediatric Dentistry at Seattle Children’s Hospital explains that it is critical for a pediatric environment to provide warm, welcoming signals to reinforce patients and parents that they have come to the right place. The most important signals to soothe and satisfy social-emotional connections that influence childhood anxiety include: bright, upbeat colors, kid-targeted activities in the waiting room, and a sincerity of staff at the practice (Sheller). In conclusion, dental anxiety, fear, and phobia have longstanding effects on children, however these negative experiences can be altered through support design, conscious choices in office décor, and positive distractions. These design considerations counteract anxiety on a broad scale to provide a positive experience through dental theming. American Academy of Pediatric Dentistry. Guideline on Behavior Guidance for the Pediatric Dental Patient. Chicago: American Academy of Pediatric Dentistry, 2005. Print. The American Heritage Science Dictionary. Boston: Houghton Mifflin, 2005. Print. Armfield, Jason M., Judy F. Stewart, and John A. Spencer. “The Vicious Cycle of Dental Fear: Exploring the Interplay between Oral Health, Service Utilization and Dental Fear.” BMC Oral Health 7.1 (2007): 2. Print. Assunção, Cristianemeira, Estelamaris Losso, Roberto Andreatini, and José Vitornogara Borges De Menezes. “The Relationship between Dental Anxiety in Children, Adolescents and Their Parents at Dental Environment.” J Indian Soc Pedod Prev Dent Journal of Indian Society of Pedodontics and Preventive Dentistry 31.3 (2013): 175. Web. Bedi, R., P. Sutcliffe, P. T. Donnan, and J. Mcconnachie. “The Prevalence of Dental Anxiety in a Group of 13- and 14-year-old Scottish Children.” International Journal of Paediatric Dentistry 2.1 (2009): 17-24. Web. Bezabih, S., W. Fantaye, and M. Tesfaye. 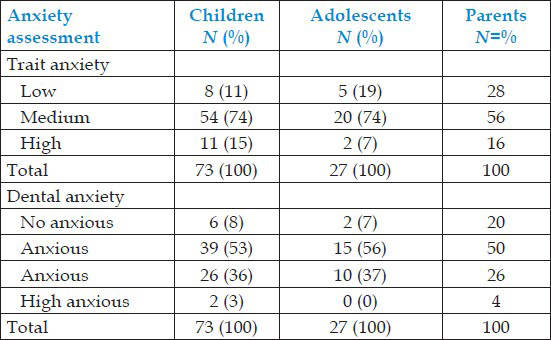 “Dental Anxiety: Prevalence and Associated Factors, among Children Who Visited Jimma University Specialized Hospital Dental Clinic.” Ethiop Med J Apr.51(2) (2013): 115-21. Print. Carpman, Janet Reizenstein, Myron A. Grant, and Deborah A. Simmons. Design That Cares: Planning Health Facilities for Patients and Visitors. 2nd ed. Chicago: American Hospital, 1993. Print. Gatchel, R.j. “The Prevalence of Dental Fear and Avoidance: Expanded Adult and Recent Adolescent Surveys.” The Journal of the American Dental Association 118.5 (1989): 591-93. Web. Goettems, M.l., T.m. Ardenghi, A.r. Romano, F.f. Demarco, and D.d. Torriani. “Influence of Maternal Dental Anxiety on the Child’s Dental Caries Experience.” Caries Res Caries Research 46.1 (2012): 3-8. Web. Hilton, Lesette. “Calming Kids’ Hospital Anxieties.” Contemporary Pediatrics. Modern Medicine Network, 1 June 2014. Web. 16 June 2016. Kohoot, M. “Latest Innovation in Patient Dental Anxiety Reduction Now Available Fr.” PRWeb. N.p., 20 Mar. 2014. Web. 13 June 2016. Lukas, Scott A. The Themed Space: Locating Culture, Nation, and Self. Lanham, MD: Lexington, 2007. Print. Milgrom, Peter, Louis Fiset, Sandra Melnick, and Philip Weinstein. “The Prevalence and Practice Management Consequences of Dental Fear in a Major US City.” The Journal of the American Dental Association 116.6 (1988): 641-47. Web. Mitchell, Victoria, and Micaela Blondin. From Imagination to Creation. Vol. 4. Calgary: Imagination Dental Solutions, 2016. Unpublished Print. Obad, J. “EVDS Student Offers Emotion-based Design to Improve Children’s Experience at the Dental Office.” UCalgary. University of Calgary, 19 Dec. 2007. Web. 15 June 2016. Rubin, Haya R., Amanda J. Owens, and Greta Golden. Status Report: An Investigation to Determine Whether the Built Environment Affects Patients’ Medical Outcomes. Martinez, CA: Center for Health Design, 1997. Print. Sheller, Barbara. “The Power of Positivity in Managing Pediatric Patient and Parent Behavior.” Dental Economics. N.p., 22 Mar. 2016. Web. 16 June 2016. Themessl-Huber, M., R. Freeman, G. Humphris, S. MacGillivray, and N. Terzi. “Empirical Evidence of the Relationship between Parental and Child Dental Fear: A Structured Review and Meta-analysis.” BDJ Br Dent J 208.8 (2010): 83-101. Print. Ulrich, Roger S., Ph.D. “Evidence Based Environmental Design for Improving Medical Outcomes.” Building Research Information Knowledgebase. Texas A&M University, n.d. Web. 16 June 2016. Ulrich, Roger S., Robert F. Simons, Barbara D. Losito, Evelyn Fiorito, Mark A. Miles, and Michael Zelson. “Stress Recovery during Exposure to Natural and Urban Environments.” Journal of Environmental Psychology 11.3 (1991): 201-30. Print.